The 90’s witnessed a vibrant renaissance in the Ghanaian music industry with the advent of the hiplife music genre, and with it came a pulsating youth culture that caught a silent nation by storm. Prominent in this new music culture were the likes of Reggie Rockstone, Obrafuor – whose “Pae Mu Ka” album is rated one of the best ever produced in the genre – , T-Blaze, NFL, Akatakyie, Akyeame, and Slim Busterr. This era of music ingenuity, could never have been without the big bass and hiphop synths of the classic beats produced by the “Da Hammer” whose Last 2 group introduced numerous talents into the industry and spanned numerous hit joints. As with most music genres however, as the years went by, the sound evolved, the music changed and the musicians of the Golden Era either changed with the music or faded away with the years. More than a decade down the line however, Empire Entertainment ,led by ace entertainment personality, Bola Ray, – himself a major player during the golden era of hiplife- in collaboration with MediaGH, are bringing back the good old days with the “Back In The Days” Concert. Set for September,21 at The Dome of the Accra International Conference Centre, the “Back In The Day” concert is going to be an annual affair which seeks to bring back to life and celebrate the great music of the past decades and the artistes and sound engineers who made it possible. This year, ace producer, “Da Hammer” will be celebrated together with the originator of the Hiplife genre, Reggie Rockstone. This was revealed at the official media launch of the BACK In The Day Concert at the Silver Lounge, Accra Mall. The event brought a feeling of nostalgia, as some of the biggest acts of the 90’s converged in the same building for the first time in more than a decade reliving the “good ol days”. 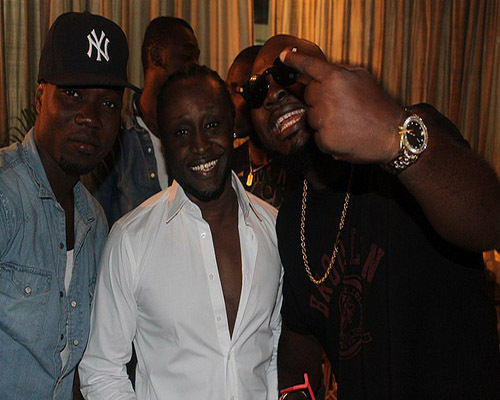 Present at the launch were, Reggie Rockstone, Samini [Batman], Akatakyie, T-Blaze, Ex-Doe, Chicago, Okyeame Kwame[ Akyeame], Hammer, VIP and a host of others. Speaking at the event, most of the artistes expressed their gratitude to Empire Entertainment and Media GH for bringing back to life the good music of the era past and urged other industry players to do same. There also seemed to have been a general consensus amongst the artistes that, the night of the 21st September, would be an electrifying one in every way as they each promised to bring to life their very best performances till date. As the weeks go by,it is expected that the full list of artistes for this year’s edition will be released ; however, the likes of Samini[Batman], Akatakyie, T-Blaze, Ex-Doe, Chicago, Okyeame Kwame[Akyeame],Hammer, VIP and Reggie Rockstone are confirmed to feature on the big night. With a host of other surprise acts set for the night, most industry pundits are predicting that the Back In The Day Concert will indeed become one of the biggest mega-jams on the events calendar in much the same fashion as Empire Entertainment’s GHANA MEETS NAIJA Concert.